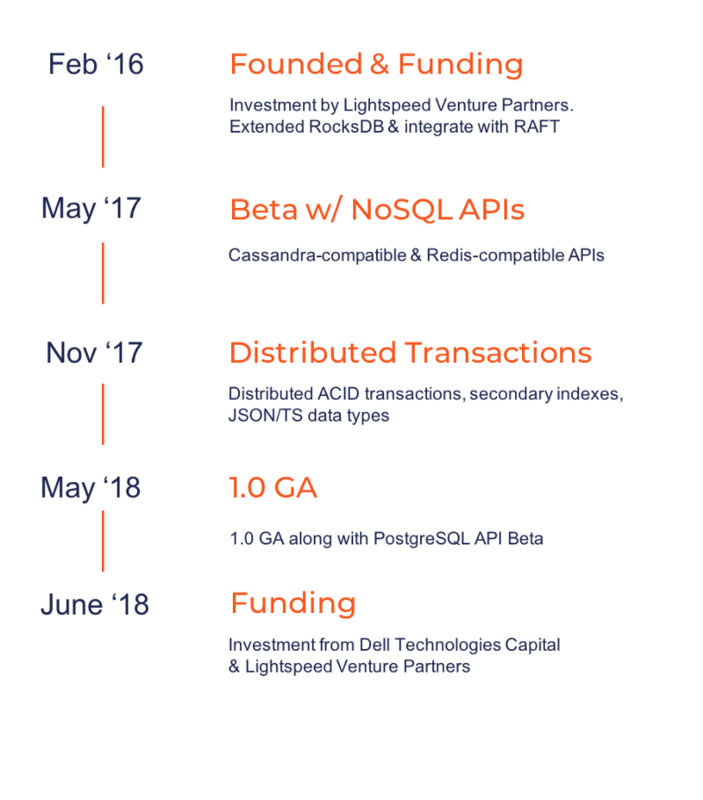 I am excited to announce that YugaByte has raised $16M in additional funding in a round led by Dell Technologies Capital and our previous investor Lightspeed Venture Partners. Combined with our previous funding of $8M, YugaByte has now raised $24M to solve one of the most challenging problems in operational databases today — bringing together NoSQL and SQL into a unified, cloud native data platform. YugaByte DB, which hit the 1.0 GA milestone last month, makes it possible for organizations to standardize on a single, open-source high-performance database for a multitude of workloads requiring both NoSQL and SQL capabilities and deployed in multi-cloud/hybrid cloud environments. The end result is unmatched application development agility along with significant reduction in operational complexity, hosting, and licensing costs. With the additional funding, we will accelerate investments in engineering, sales, and customer success to scale our support for enterprises building business-critical applications in the cloud. Dell Technologies Capital, which came out of stealth last year, has been an active investor in nearly 90 early-stage startups since 2012 with 37 successful exits, including 3 unicorn IPOs within the past nine months. We are pleased to welcome Deepak Jeevankumar, Managing Director at Dell Technologies Capital, to our board. He’ll be joining Ravi Mhatre, Founder & Managing Director of Lightspeed Venture Partners, on the board. We are truly grateful for the continued support from Ravi & Lightspeed and for being with us from the very beginning. NoSQL or SQL? Why Not Both? Business-critical applications are increasingly being deployed onto cloud native microservice architectures running on Docker and Kubernetes. (We are at DockerCon this week!) As a result, enterprises are requiring the underlying data tier to also offer capabilities that can prove incredibly challenging for traditional databases to support. For example, many organizations rely on SQL databases like Oracle and PostgreSQL for their ACID compliant systems of record. However, unlike monolithic SQL databases, YugaByte DB offers the ability to horizontally scale nodes globally, across regions, while remaining fully ACID compliant. YugaByte DB also delivers linear write/read scalability, plus auto-rebalancing, sharding and fault tolerance. These features often prove to be very costly or difficult to implement in traditional SQL databases. Organizations also end up relying on NoSQL databases like AWS DynamoDB, Azure Cosmos DB, Apache Cassandra and MongoDB for workloads requiring elasticity, super fast write performance, and flexible schemas — features which traditional SQL databases lack. However, this fragmented, NoSQL + SQL approach increases operational complexity, hosting and software licensing costs, plus hinders developer and business agility. YugaByte DB delivers all the features you’d expect from a NoSQL database, plus high performance ACID transactions, and elastic global data distribution across both public and private clouds. YugaByte DB enables organizations to standardize on a single database without having to compromise on speed, consistency or scale. 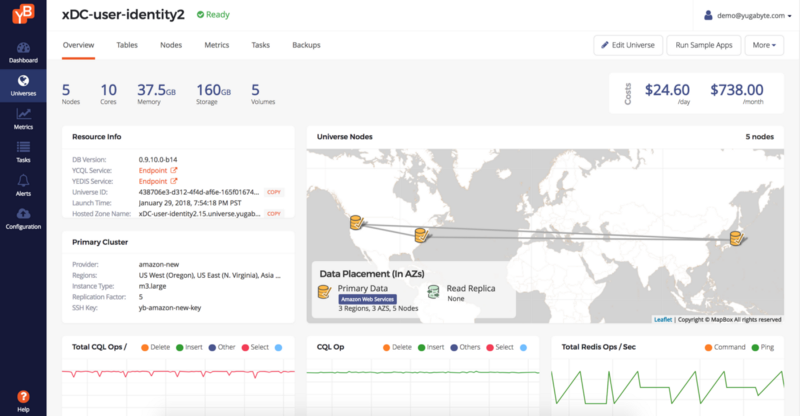 YugaByte’s multi-model database offers support for Apache Cassandra and Redis compatible APIs, along with beta support for PostgreSQL API — all three powered by a common underlying storage and replication engine. Today’s announcement is the latest milestone in YugaByte’s journey that started in February 2016 when Karthik, Mikhail and I (Kannan) founded the company. We had certainly undertaken an ambitious and technically challenging task — that of building a high performance open source database that works both as a transactional NoSQL and a planet-scale SQL database and is also capable of running on any cloud or container infrastructure. However, having had the benefit of working in the guts of Oracle’s RDBMS for over a decade and later leading the NoSQL efforts at Facebook it was clear to me (and my co-founders) that, while challenging, this was indeed tractable. We were also confident in the need for such a transformative technology from our days working as the engineers who led the massive scaling of Facebook’s multi-petabyte NoSQL platform (which powers Facebook Messenger and Facebook’s internal time series monitoring system). YugaByte DB 1.0 is already enabling organizations to realize the advantages of combining SQL and NoSQL in a single database. For instance, YugaByte DB powers the Location Tracking Service at Turvo, a real-time collaborative logistics platform. Get started! Download and install a cluster, plus get a sample app up in running in just a few minutes.